2019 January 31: : An intense double band, auroral glow reaching to the zenith and near to engulfing the region in Ursa Major close to the direction of comet 46P. A slack, but cold NW airflow with ground temperatures below freezing, all conspiring to make another challenging night's work! 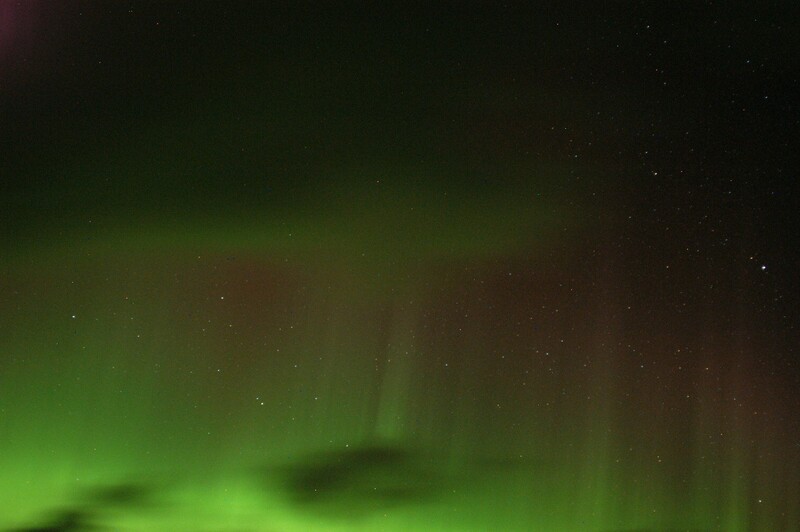 Good seeing but transparency around 7/10 compromised by the auroral glow. 2019 January 31, 22h 19m UT. Looking NNW with the bright, first magnitude stars Deneb (L) and Vega (R) low down close to cloud. 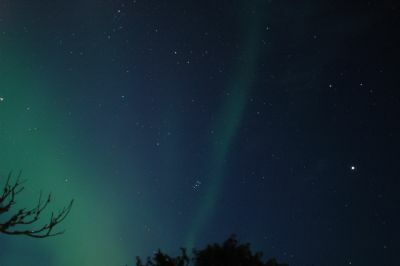 The dark areas between the auroral bands is, in fact, clear sky indicating stars to mag. 4.5. The glow had commenced shortly after 18h with, then, significant cloud cover. 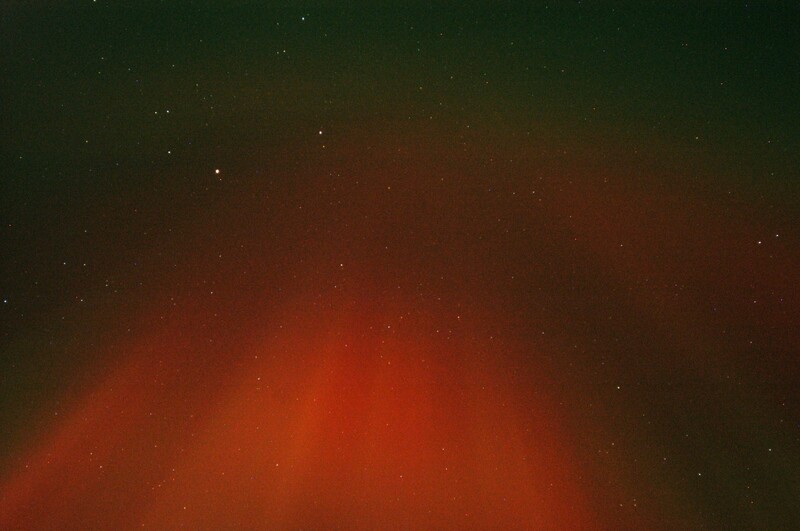 Variable cloud from 23h accompanied by slow, diminishing auroral glow. A 4 sec. exposure with Nikkor 24mm f/2.8 D300 SLR ISO 2000. There was a near repeat performance from the weather and the sky last night 18/19 March. Following a fine day, with reduced wind, the sky cleared to give a good opportunity to see planets Mercury and Venus, along with a very fine, crescent Moon in the west shortly after sunset. 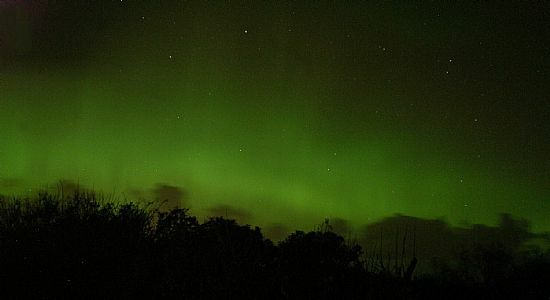 There then followed a prolonged auroral display similar to that of March 9/10. There was an extremely intense, northern auroral glow reaching to some 30 arc-degrees from which fine rays immerged in quick succession. The display went on into the small hours of the 19th with a northern arc and glow the main feature. 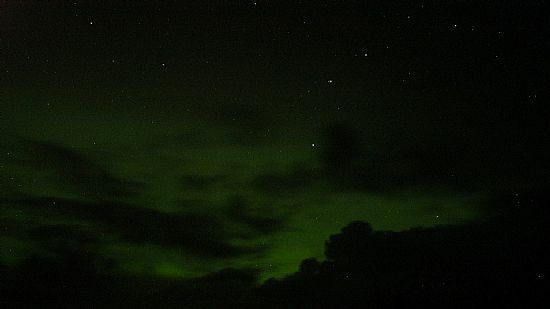 Looking due north at 20h 18m UT from Springfield, Rousay. A 5 sec. exposure Nikkor 24mm f/2.8; D300 SLR ISO 2500. Yesterday (March 9th), from around noon running into the dark hours and then through the early hours of the following morning, gave exceptionally clear skies. This provided sky watchers the opportunity to see planets Mercury and Venus in close company in the western sky about one hour after sunset. 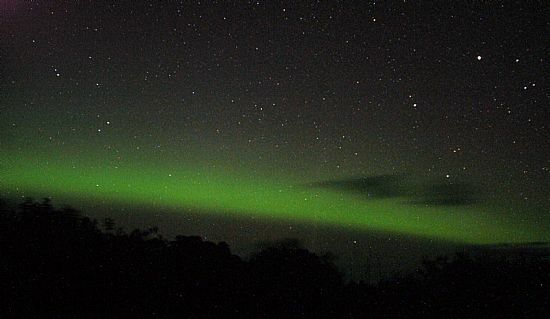 An intense northern, auroral glow and arc became apparent shortly after; this went on to yield short-lived rays at intervals well into the night. The glow persisted close to dawn with moonrise and gathering cloud punctuating the display. Looking due north from Springfield, Rousay, at 21h 30m UT. A 4 sec. exposure Nikkor 24mm f/2.8; D300 SLR ISO 2500. The bright star to the east (right) is Vega, second brightest star in the northern celestial hemisphere and 5th brightest star in the entire sky. 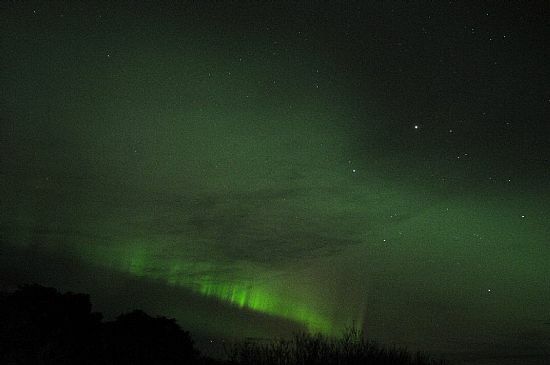 The auroral activity began in the early evening, in strong twilight at around 17 00 hrs some 70 minutes after sunset. The entire sky was host to various short-lived elements, particularly in the east with rays extending practically to the zenith. To the eye the light from rays and bands would have appeared diffuse and not unlike cirrus atmospheric clouds. 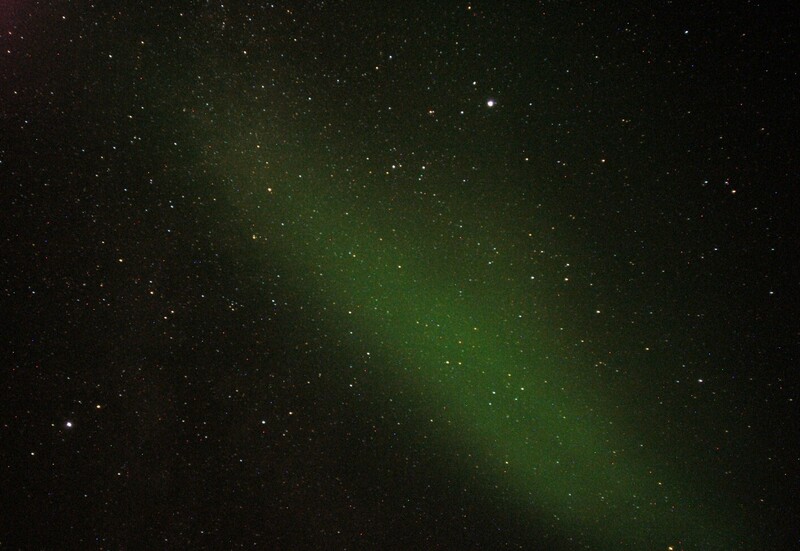 The green colouration, evident on digital images, would not have been experienced by the “eye” except in very intense features closer to the northern horizon. Above images from Rousay: 18h 27m; 28m 29m and 45m respectively. 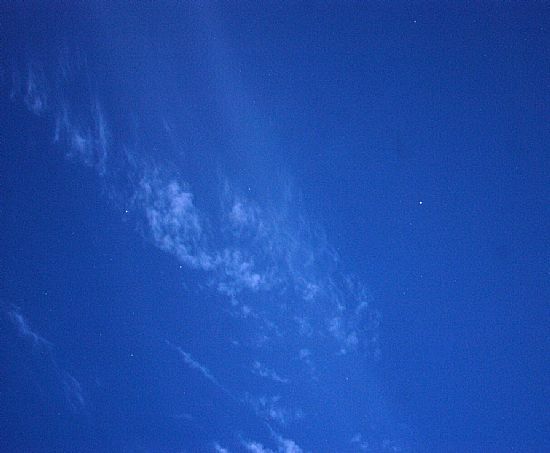 Note: In third image, the Pleiades cluster (centre) and bottom right a short trai from a passing helicopter!! 2017 February 27. A fine night through to dawn of the28th with an auroral glow lasting into the small hours from early evening. Caption: Looking due north from Springfield, Rousay February 27th at 21h 22m UT. Bright star Vega low, centre stage. A 10 second exposure 28mm f/2,8, D300 SLR ISO 2000. The old year out and the new one in on a gentle arc of the auroral glow. 2016 December 31/2017 January 01. Auroral Glow: persistent and intense at times reaching through 170° azimuth, rising to 38° altitude and lasting some 8 hours. 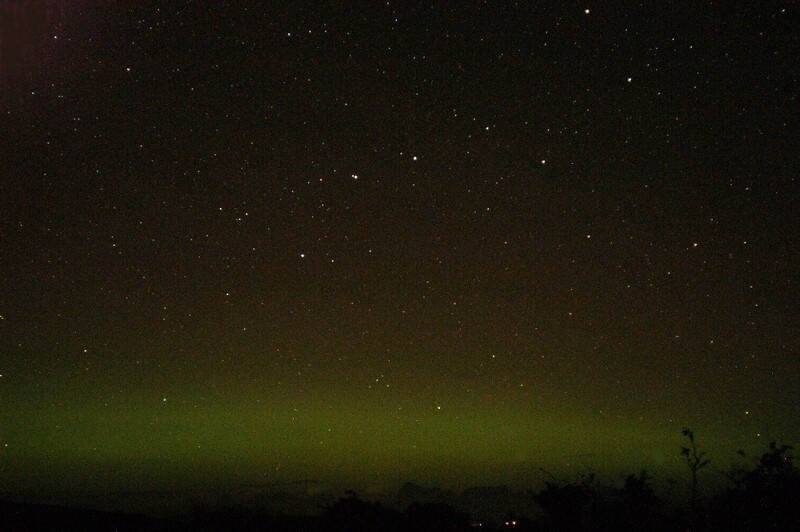 Looking due north (with The Plough holding centre stage) seen from Springfield, Rousay, at 19h 44m UT. Nikkor 24mm f/2.8, D100 SLR, exp. 13 sec. ISO 600. Another clear night up to around 01h 30m UT on the 27th. 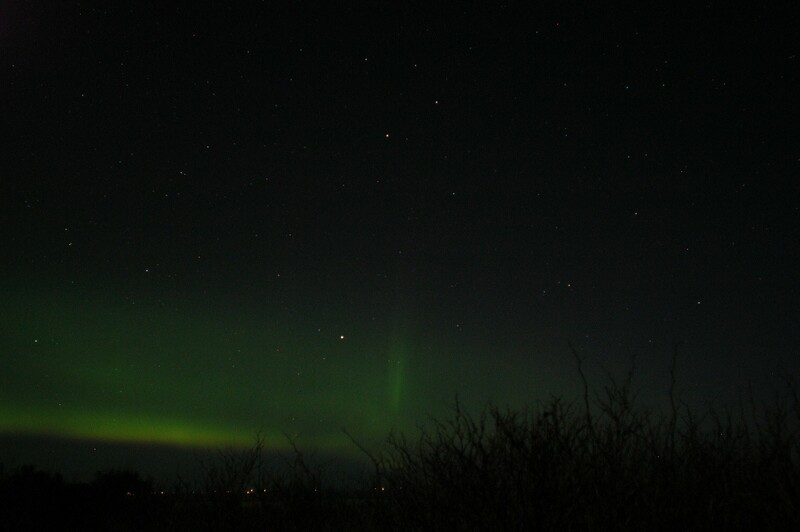 Again, there was an auroral glow, the residue from that on the 25th but not so intense. However, there were some active rays this time venturing into the red and which culminated in a fine display shortly after midnight (UT) on the 26th. 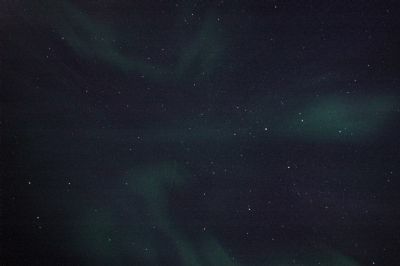 Seeing and transparency were exceptional so that in parts of the sky unaffected by the auroral activity it was possible to image stars below visual magnitude 16. Our standard test for transparency on M31 (Andromeda Galaxy) gave one the finest results ever achieved with the fast, telephoto lenses. More on this later. 2016 September 27. Looking NW at 00h 02m UT. A 8 sec exposure, Nikkor 24mm f/2.8 D100 SLR ISO 800. Note: The constellation Hercules far left: those who know their globular clusters may detect M13, the brightest cluster of its class in the northern celestial hemisphere. 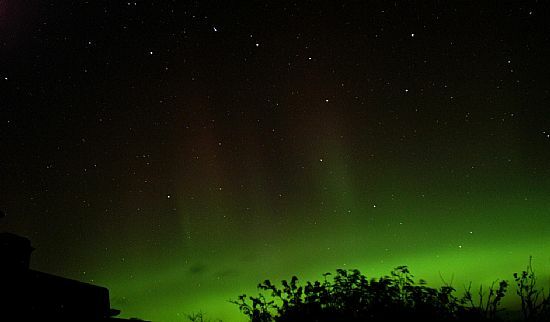 There was an intense auroral glow lasting several hours from evening twilight. There was little "dancing" but rays were present and the glow became fragmented into patches at times, rising to an altitude of some 40 arc-degrees and more. Looking a little north of NW at 20h 23m UT. The "plough" standing out well against the glow. An 8 sec. Exposure, Nikkor 24mm f/2.8, ISO 800, D100 SLR. The sky remained clear through to dawn and into the daytime sky allowing superb viewing of Mercury before sunrise (with a beautiful “old” Moon in high altitude). See also DIARY page. 2016 September 01 Auroral Glow. A few breaks in cloud cover revealed an intensive, auroral glow rising to over 20° above the northern Horizon. 2016 September 01 21h 56m UT. A 12 sec. Exposure Nikkor 24mm f/2.8, D100 SLR ISO 600. 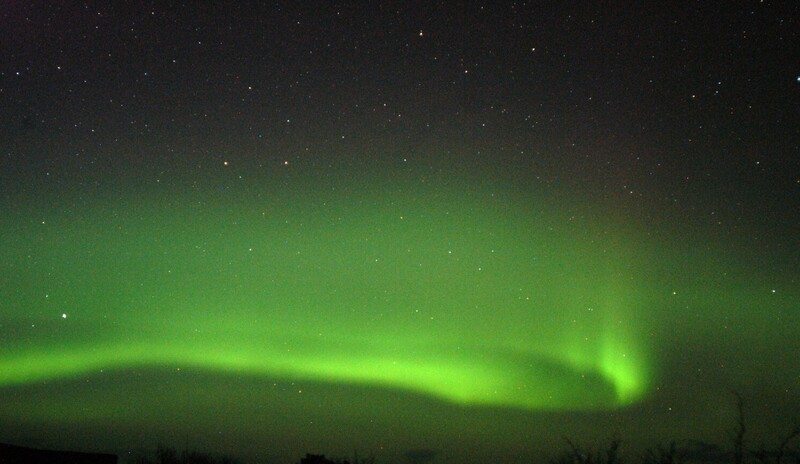 2016 March 06: A Brilliant Display of the aurora, Sunday 6th March 2016. 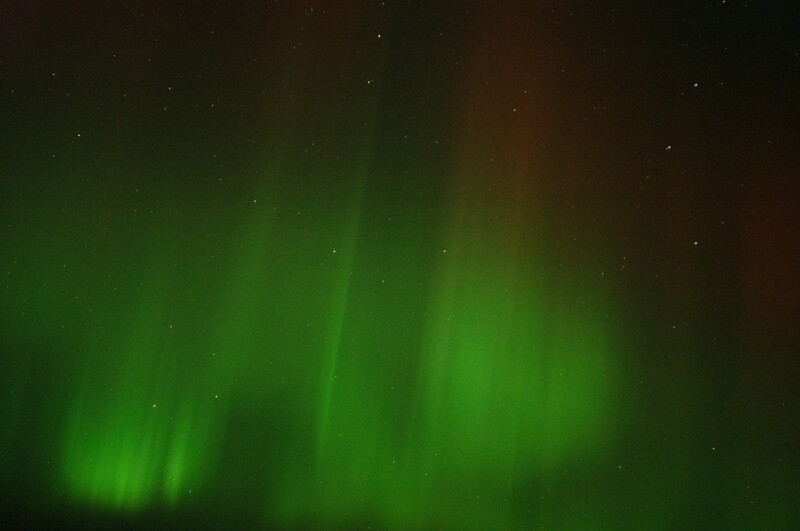 There was an exceptionally active display of the aurora from about 19h UT. At times the entire sky was lit to the strength of a full Moon. 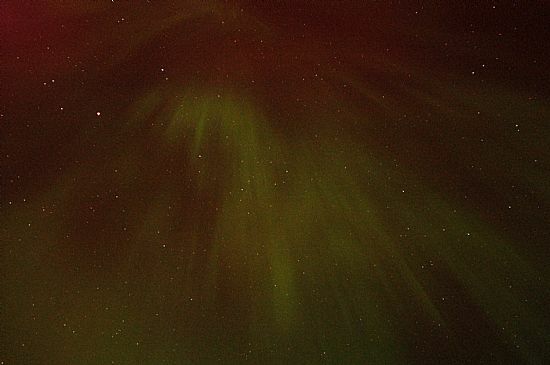 There were fine examples of the corona overhead with much of the eastern and western sky "ablaze" in green (showing mostly "white" to the unaided eye). 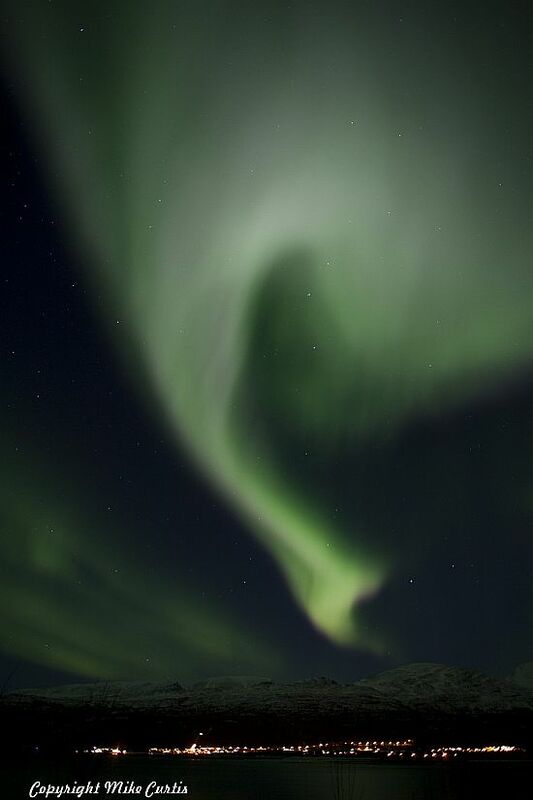 Go to Aurora 2016 Mar 06 for a selection of images. Fiery Merry Dancers Join Geminid Meteors. The weather settled down for a period leading up to the expected maximum for the Geminid meteor shower this year, 2015. Despite periods of scattered cloud there were a number of hours of clear skies on several nights when it was possible to see some good examples of meteors. The shower was expected to peak in mid-afternoon of the 14th December. Skies were clear in the early hours of that day from around 03h UT through to dawn. We made an hourly count of between 70 and 80 meteors during this period. There were some half dozen examples brighter than Jupiter (well placed in Leo in the southern sky throughout). The brightest recorded meteor ran parallel to the horizon from west to east below Leo at around 06h 15m UT at estimated at apparent visual magnitude –5 (a little brighter than Venus low down in the SE in constellation Libra.) leaving an irregular luminous trail persisting for some 4 seconds. 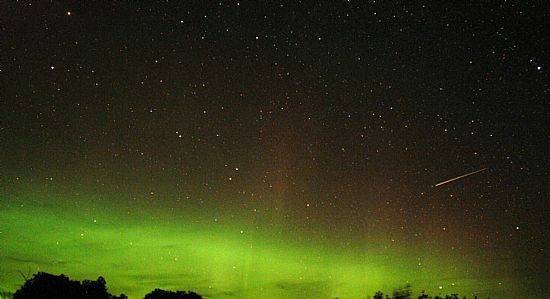 The early evening of the 14th gave a sky of scattered, dense cloud with a brilliant auroral glow showing in the gaps. 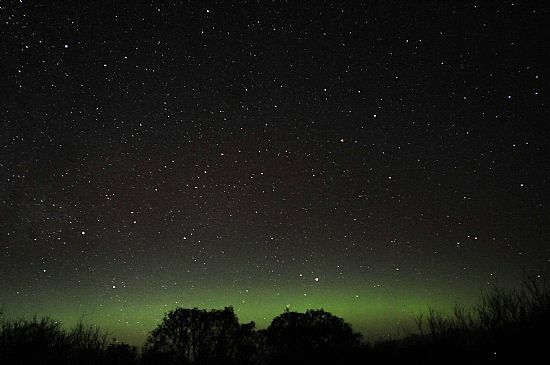 Some clearer intervals revealed a display of bands and rays with patches of red and green appearing in the NE and engulfing the meteor radiant in Gemini. Cloud cover became more general from around 20h UT. 2015 December 14 22h 01m UT: A 10 sec. exposure. Nikkor 28mm f/2.8 D100 SLR ISO 800. Looking due north with the end-tail of Ursa Major at top of rield. 2015 November 06/07. A short but vivid display of the Merry Dancers in the early morning sky before Dawn. 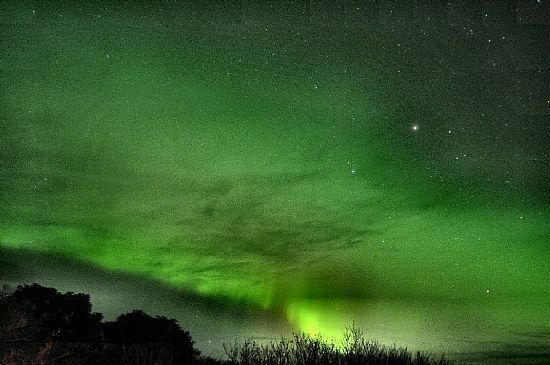 Those who rose early to watch the continuing planetary spectacular with the three planets Venus, Jupiter and Mars moving out of Leo into Virgo and joined this morning by the crescent Moon, will have been rewarded with a fine display of the aurora too. 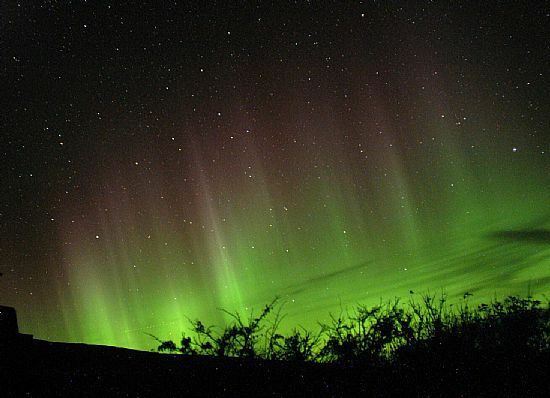 The early night of the November 6th cleared to give an all-pervading, faint auroral glow covering the entire sky. 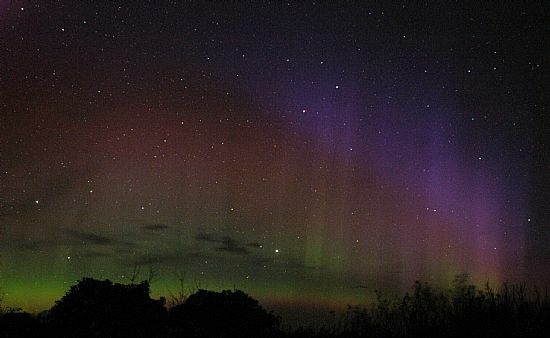 the glow gradually shrank into the north as the night progressed leading 04 hours of the 7th to a modest display of banding that erupted for a short period after 05 hours into a vivid display including mostly red and purple colourations. 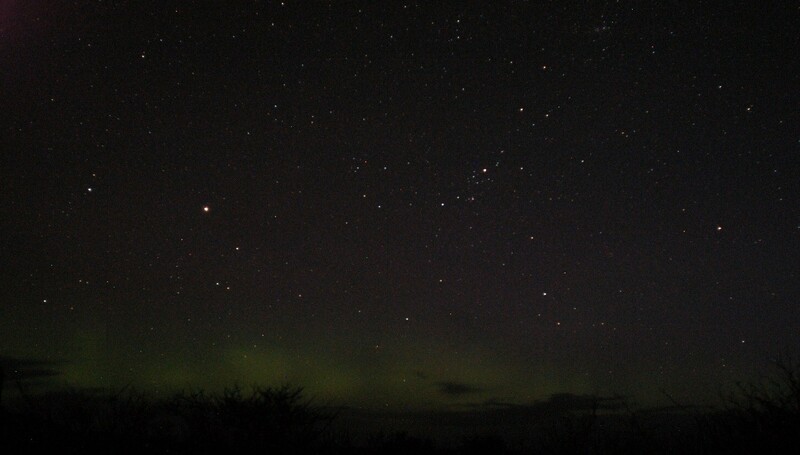 2015 November 07: Springfield, Rousay, looking north at 05h 15m UT. The bright star low down is Vega, second brightest star in the northern hemisphere with Deneb in Cygnus left and Eltanin (gamma Draconis) above centre. 2015 October 8th: Merry Dancers Caper Across the Milky Way. 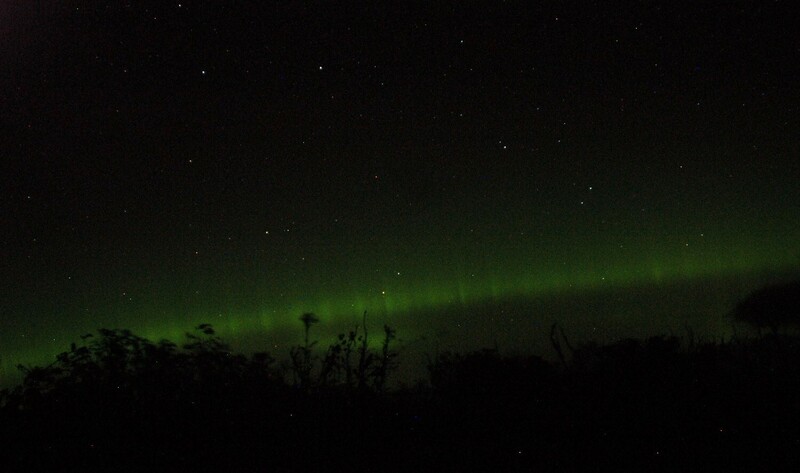 Due to poor weather, we in the Northern Isles were denied a full view of the brilliant display of the aurora 7th/8th October seen as far south as Mid-Wales and elsewhere in the south. However, there was a limited repeat performance on the 8th/9th with an intense northern auroral glow and banding. In addition, for a brief period, fast moving, pulsating patches mimicking the Milky Way at times could be seen high up in the SW sky. 2015 October 08, 20h 45m UT. A bright "patch" obscuring part of the Milky Way with bright stars Vega (top right) and Altair (bottom left showing well, the two prominent "corners" of the "Sumner Triangle" (Deneb excluded form the frame). 2015 October 08, 21h 06m UT. Looking north with a meteor trail (far right). 2015 October 08, 21h 29m UT. Looking a little west of north with the "Plough", part of the constellation Ursa Major (Great Bear). All images Nikkor 24mm f/2,8, D100 SLR (static camera), 12 sec. ISO 800. 2015 September 10/11. 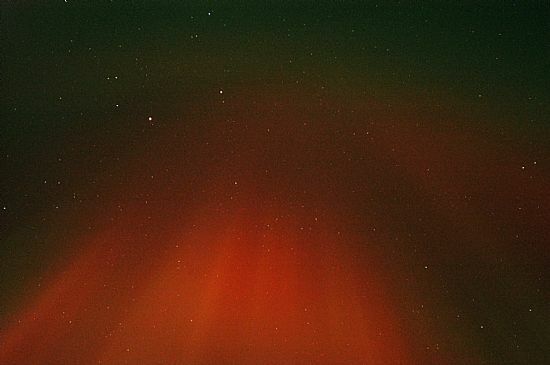 Intense auroral glow and banding . 2015 September 10. 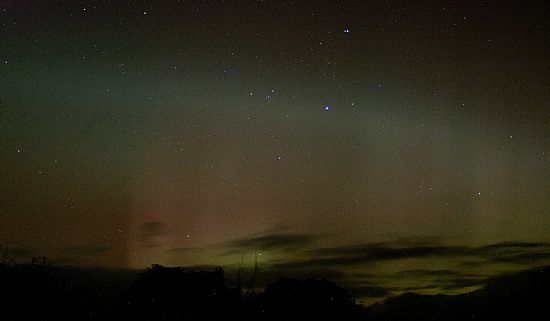 Auroral activity from 21h through to the following morning when at 02h approximately low cloud obscured the view. Looking due north from Springfield, Rousay. A 15 sec. exposure Nikkor 24mm f/2.6, D100 SLR ISO 500, The bright star is Capella (alpha Auriga) third brightest star in the northern celestial hemisphere, Left click to enlarge. 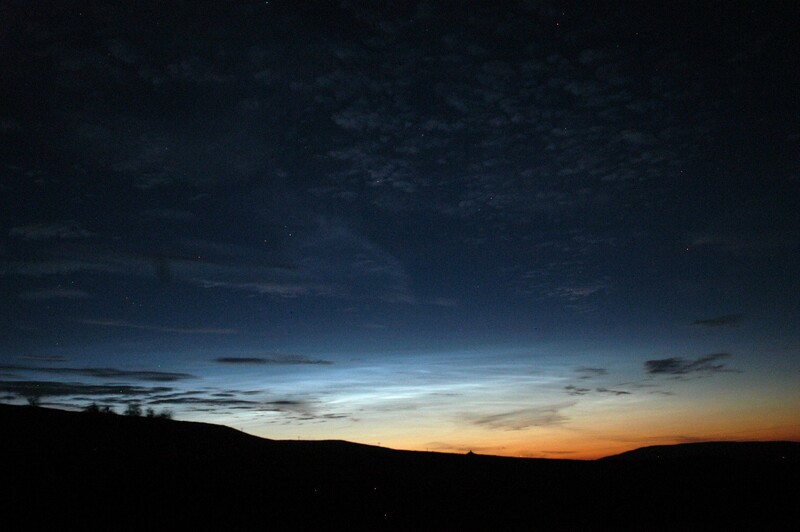 A sustained display of the Noctilucent Clouds 21/22 July 2015. 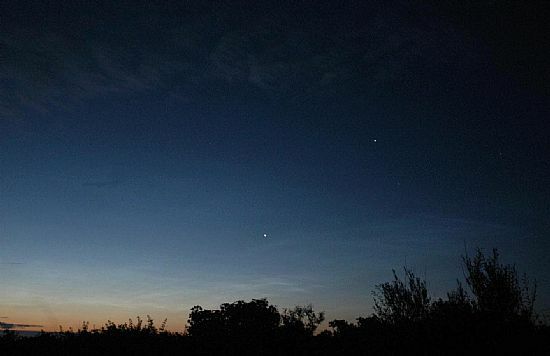 Weather conditions with extensive cloud cover have made it virtually impossible to observe our late night skies for the presence of the noctilucent clouds. These are generally seen in the northern hemisphere a few weeks around the June summer solstice. Although not quite the most "brilliant" display, the effects were extensive and persistent lasting some three hours around midnight (UT). A 1/3 second exposure Nikkor 24mm f/2.8, D100 SLR ISO 600 looking NNE at 00h 26m UT. Note the bright, yellow star Capella (visual magnitude 0.2) and third brightest star in the northern hemisphere. Also visible in the same constellation are Menkalinan (beta Aurigae, mag 1.9) and other much fainter stars down to magnitude 3.8. A 1/3 second exposure Nikkor 24mm f/2.8, D100 SLR ISO 600 looking NNW at 00h 28m UT. 2015 April 20: Merry Dancers compete with twilight in the late night sky of April 20, 2015. The Merry Dancers put on a brief, spectacular display late on Monday night. There was a strong, accompanying auroral glow merging with twilight, which lasts all night as seen from Orkney between April 24th and August 20th. 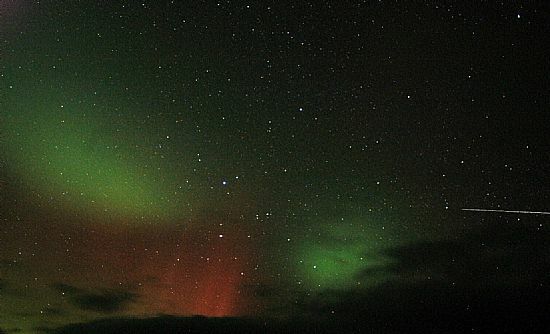 Looking due north from Springfield, Rousay April 20th at 22h 38m UT. 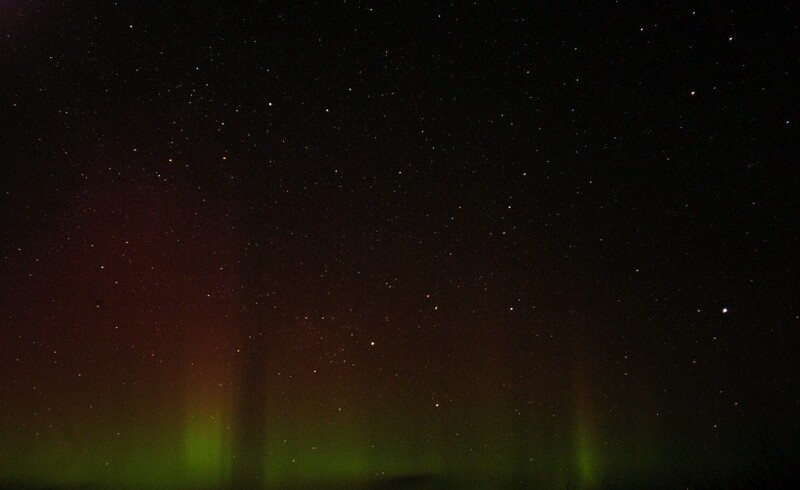 Looking due north from Springfield, Rousay April 20th at 22h 39m UT. Both images: Nikkor 24mmf/2.8, D100 SLR ISO 600. Exposure 10 sec. 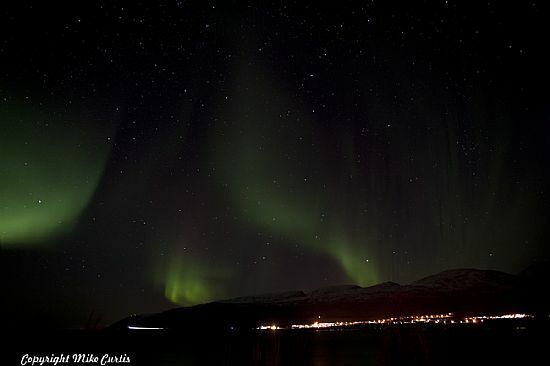 Aurora 2013 December 26: The show goes on! 2014 December 25. The auroral glow continues: Looking NNW at 21h 50m UT. A 25 sec, exposure Nikkor 24mm f/2.8 lens and D100 SLR ISO500. The bright star low down to the west (left) is Vega. Aurora 2013 December 24: The auroral glow continues throughout the night, the first of any sustained clarity in over five weeks. Looking north at 23h 37m UT. A 25 sec, exposure Nikkor 24mm f/2.8 lens and D100 SLR ISO500.The bright star low down to the east (left) is Vega (visual magnitude 0.01 but variable over a small range –0.02 to +0.07, and on average the second brightest star in the northern hemisphere). The star above (right) is gamma Draconis (“Eltanin” at viual magnitude 2.2, the brightest star in constellation Draco.) Some trailing of images due to long exposure time on static camera. 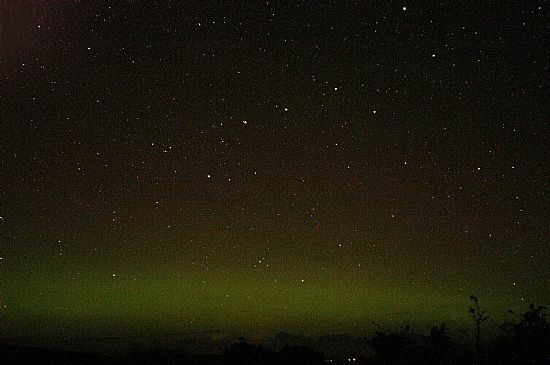 The sky looking due north from Springfield, Rousay at 21h 30m UT. A 25 sec, exposure Nikkor 24mm f/2.8 lens and D100 SLR ISO500. The “Plough” region seen during a brief break in cloud cover. 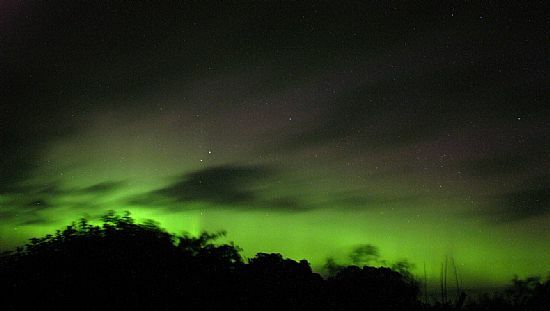 There was an intense auroral glow on December 21/22 lighting the cloud-laden sky almost to the zenith at times. Brief “clearances” in cloud cover revealed some banding and rays but overall the weather was far from conducive for this sort of viewing! The sky looking due north from Springfield, Rousay on December 22 at 00h 09m UT. A 20 sec, exposure Nikkor 24mm f/2.8 lens and D100 SLR ISO500.The bright star low down to the east (right) is Vega, second brightest star in the northern hemisphere. 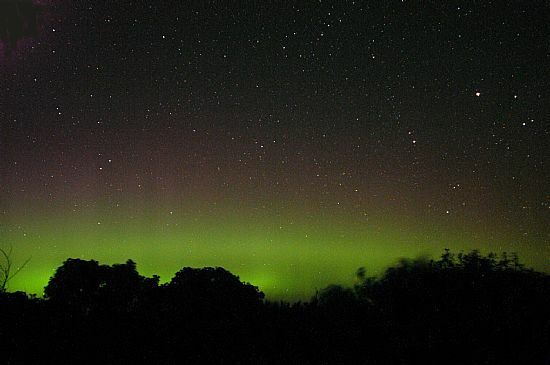 2014 August 27: Auroral activity prior to overcastting sky by midnight. 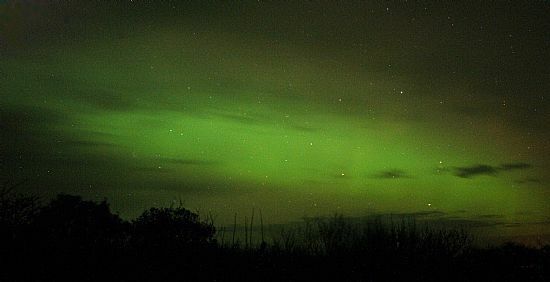 There was an intense northern auroral arc and glow visible from approximately 21h 40m UT until heavy cloud from the SSE swamped the entire sky before midnight UT. There were signs of short-lasting rays but weather conditions ruled out further observations. The images below show the sky looking due north from Rousay at around 23h UT. First image shows brilliant star Capella (alpha Auriga) right, “foot” of Ursa Major left. Nikon D100 SLR 24mm f/2.8 Nikkor lens, 10 sec. exposure at ISO800. 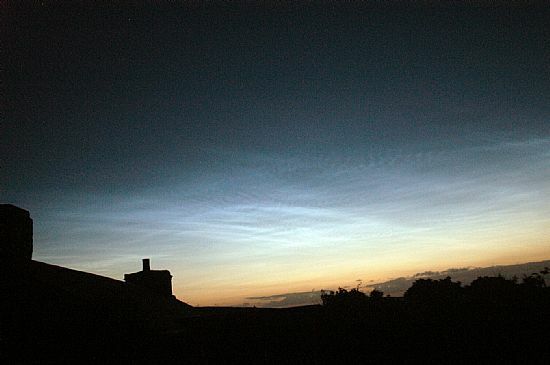 2014 July 07/08: Noctilucent Clouds show up at last! A fine display on the night of July 7/8. 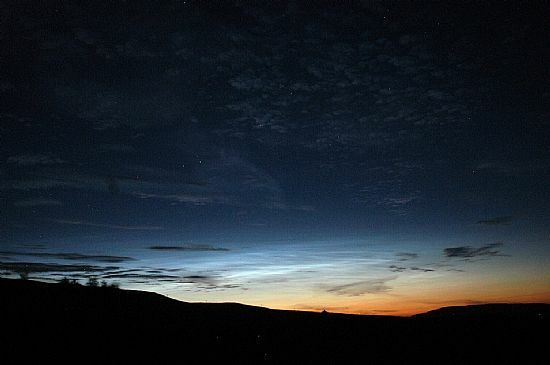 Noctilucent Clouds. 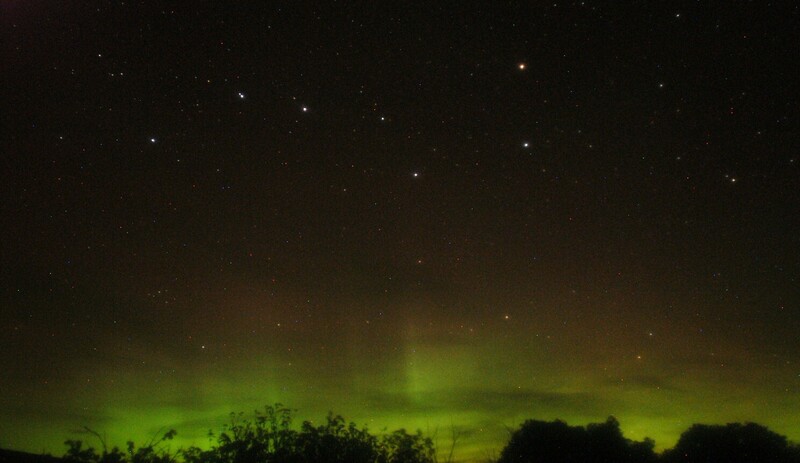 However, the "night" of July 7/8 July gave a fine display right through from late "evening" to the early hours. Features were present in most areas of sky except the extreme western sector. A few minutes before true midnight on 2014 July 07. Looking North. Close to the zenith with bright star Vega (left). 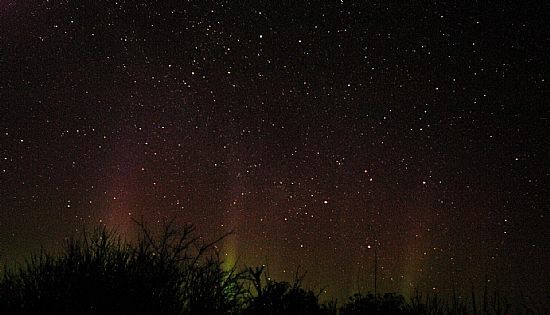 Auroral Activity: 2014 April 05. 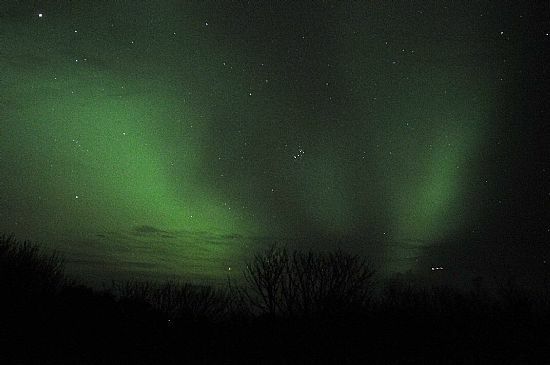 A cloudy start to the evening but by 20h 30m UT cloud began to disperse giving a clear slot from around 21 00h t0 22 30h UT, The auroral glow was present throughout this period with some extended rays reaching up from the northern horizon to altitudes of 40°. The Moon (phase 37%) high in the constellation Orion close to the border with Gemini and at an altitude of approximately 38°. Looking north at 21h 26m UT. The bright star to the far right is Deneb (alpha Cygni). On the far lower left is beta Andromedae with the Andromeda galaxy (M31) visible above right (ringed). Nikkor 24mm f/2.8 D100 SLR ISO 500- a10 sec. exposure, static camera. 2014 February 27/28. The most intense displays as observed from Orkney in the current solar maximum. Supernova in M82 Galaxy. Despite the bright auroral background a fine image of the galaxy was secured with one of our larger instruments. And at around 04 hrs images of comets LINEAR & Lovejoy were obtained and are now available on the COMET TWO page. 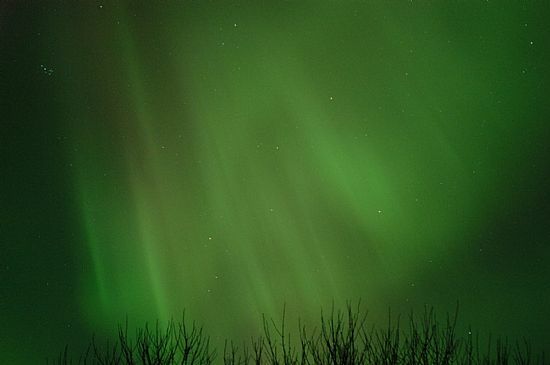 AURORAL GALLERY page: A further selection of images now available at Aurora 27/28 Feb 2014. The “corona” a little south of the zenith with the bright star Capella. Another view close to the zenith against the background of constellation Auriga and the bright star Capellea. 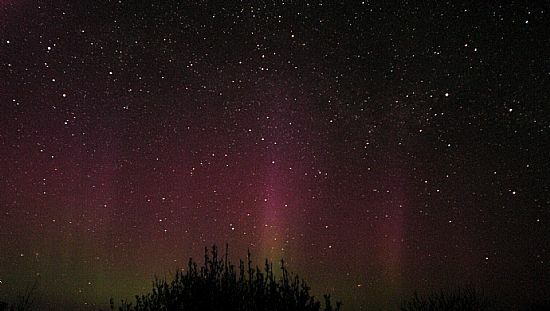 2014 February 23: Intense auroral activity. 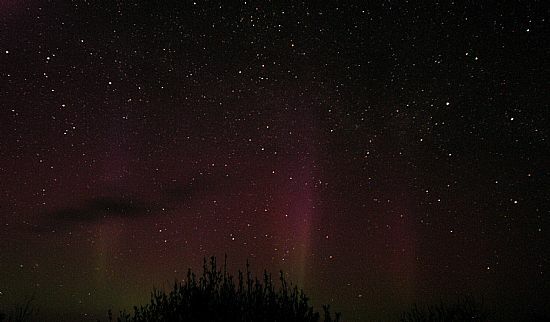 A very intense display of the aurora from early evening twilight up to midnight. Little in the way of colour variation but a brilliant double arc together with swirling coils, sadly missing from recent displays. 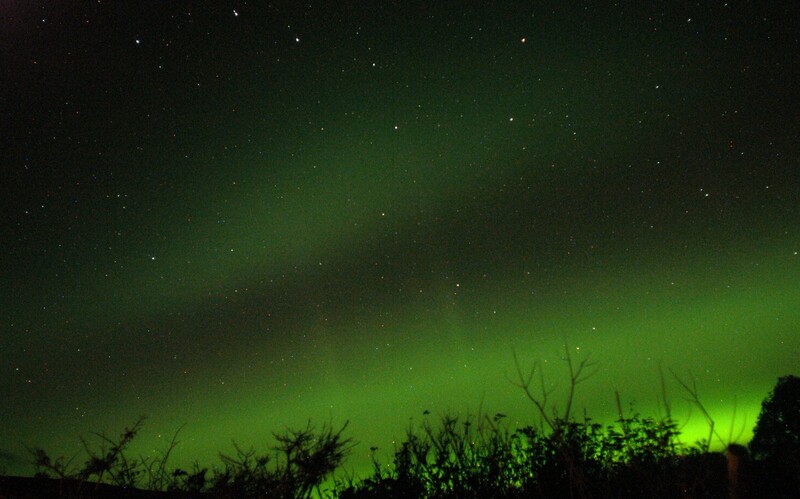 Light from the aurora was detected in the zenith at times impeding work on the supernova in M82. A 6 sec. exposure Nikkor 24mm f/2.8 D100 SLR: ISO 500. Looking NNE from Rousay at 19 43m UT. 2014 February 20. Intense auroral glow in single arc and lower infilling to altitude 30 degrees. Active for over 2.5 hours. 2014 February 20, 21h 45m UT. Nikkor 24mm f/2.4: 10 sec exposure at ISO 400. D100 SLR. Bright star Vega lower right, Deneb in the tail of Cygnus (swan) left. Looking North. 2013 November 09: 04h 06m UT. 2013 November 07: 22h 32m UT. 2013 October 30. The sun is at or close to maximum in the solar eleven-year cycle. 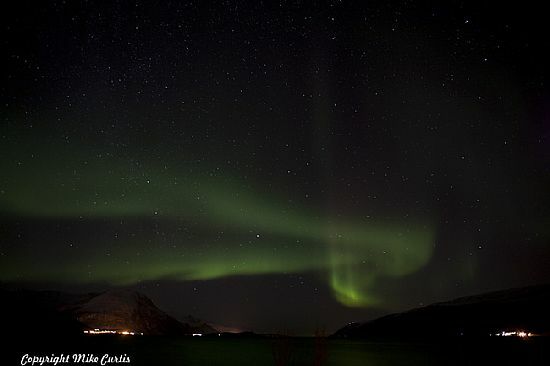 Displays of the aurora are likely at any time within the next 48 hours, and with the Moon in its last quarter and a clear sky, conditions could not be better. 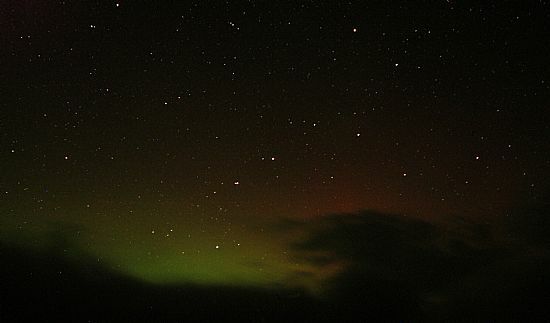 The sky looking due north from Springfield, Rousay, October 30th at 21h 25m UT. A 8 sec. exposure 24mm f/2.8 D100 SLR ISO 600. 2013 October 08/09. 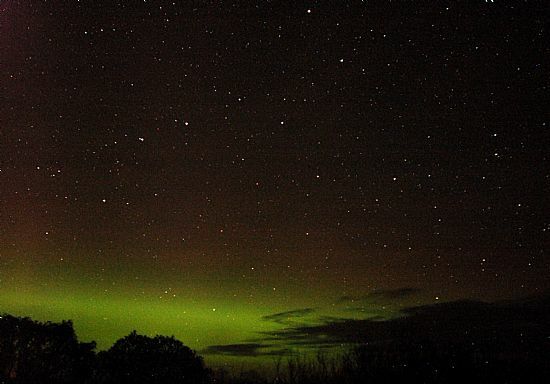 Auroral Activity was evident in the late hours of Tuesday and early hours of Wednesday. 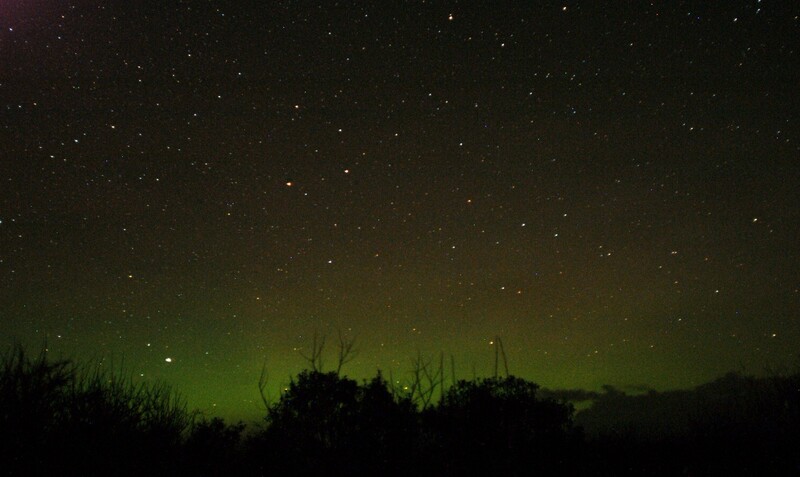 Cloud cover prevented any serious imaging but within the few, short breaks it was evident that the display was extensive seen mainly as green swathes of slow-moving bands against a strong auroral glow. Another display is likely within the following 24 hours as indicated by solar emissions observed from Rousay October 09, 12h 10m UT. 2013 October 09, 15h 00m UT. 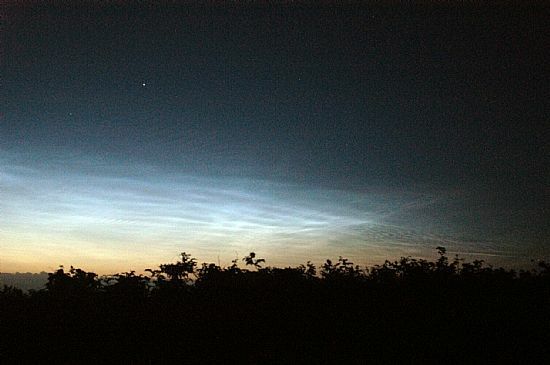 2013 Early August apperacne of Noctolucent Clouds. 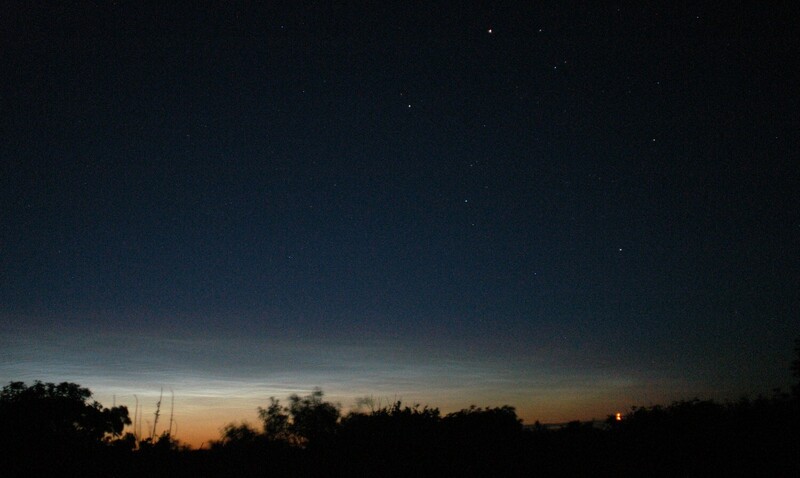 There have been a number of displays of the clouds close to the N and NE horizon near to or past true midnight. Twilight is still much in evidence at this time but decreases by the day until by the 19th, for a few minutes close to midnight, we shall once again have the opportunity to experience twilight-free nights. 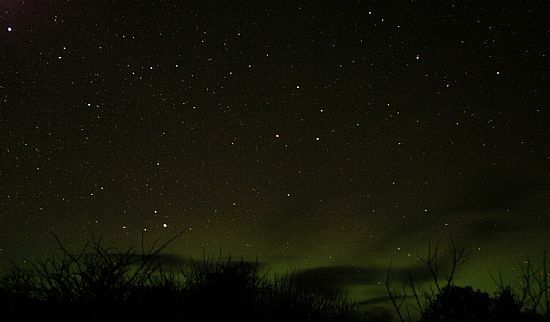 Of course, ground-based light pollution is an ever-growing problem here in Orkney as elsewhere throughout the planet. 2013 August 03, 01h 10m with the crescent Moon (over-exposed) to the far right. Looking NNE from Springfield, Rousay. A 2.5 sec. exp., D100 SLR 24mm f/2.8, ISO 600. The constellation Auriga is clearly seen above with the brilliant star Capella (3rd brightest star in the northern hemisphere). 2013 August 08, 01h 15m with Jupiter to the far right with Castor and Pollux to the left (Pollux close to the horizon immersed in NLC). Looking NE from Springfield, Rousay. A 2.5 sec. exp., D100 SLR 24mm f/2.8, ISO 600. 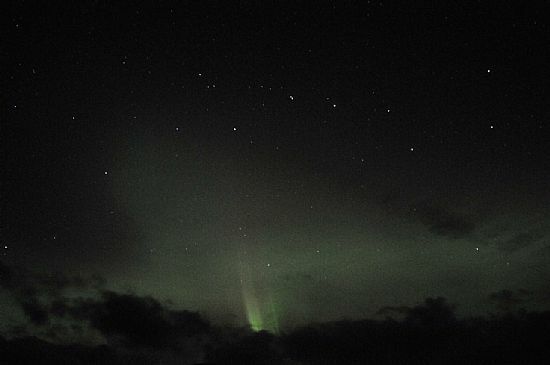 Central to our research here on Rousay is the monitoring of the Earth’s upper atmosphere in visual light. 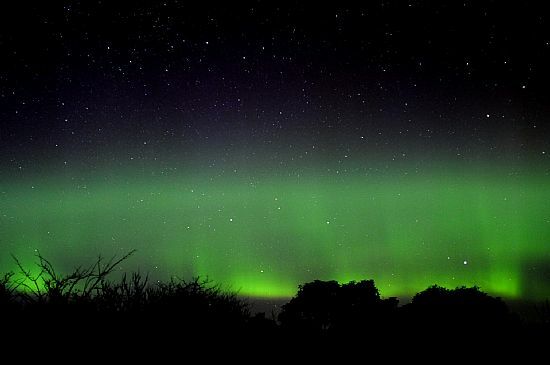 Aurora, unless they are very bright, are rarely seen in high latitudes in summer due to the all-invasive twilight; the auroral glow that is almost constantly present and visible from the latitude of Orkney, is completely swamped by the twilight. 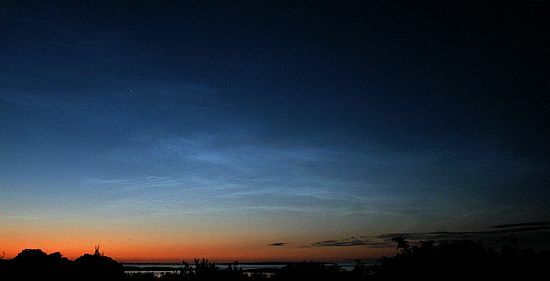 The Noctilucent Clouds, on the other hand, can only be observed in the mid-summer period usually around four weeks either side of summer solstice but we have recorded them as late at mid-August. Readers will know only too well that our summer skies here so far have been cloud-racked in the main. The night of July1/2 gave us the first opportunity to record the phenomenon this year (2013). 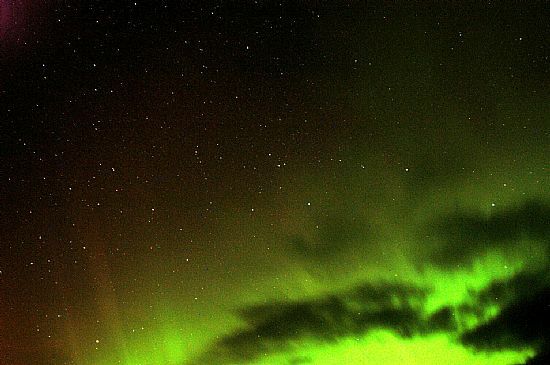 In an otherwise clear sky, it is quite possible to view stars as faint as or fainter than the Pole Star (Polaris, mag. 2.1) as a backdrop to the noctilucent clouds. A full report will appear in late August. 2013 March 31. Current solar activity would indicate the possibility of some displays of the merry dancers over the coming days. Short bursts of activity on the evening and night of March 31 made imaging Comet PanSTARRS (in the NNW at the time) something of a challenge. 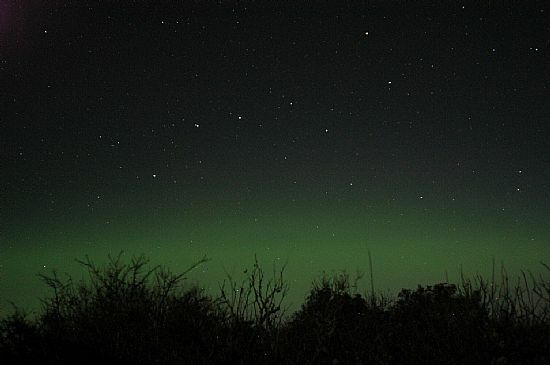 2012 November 20th: Auroral Glow. 2012 November 20, 20h 31m UT. Looking due north from Springfield, Rousay. Nikkor 24mm f/2.8, ISO500. Exposure 8 sec. D100 SLR. Moon phase 53%, altitude 14 degrees. 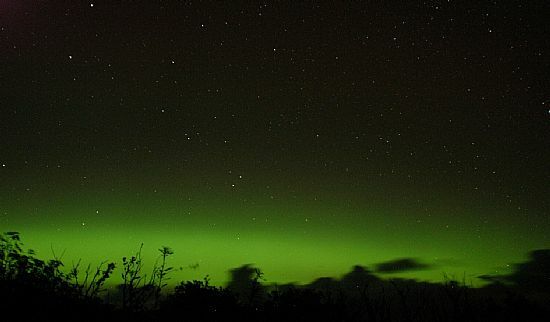 There was an extensive and intense auroal glow through the dark hours of October 8/9 with some rapidly developing rays. Looking NW from Springfield, Rousay. A 10 sec exposure Nikkor 24mm f/2.8. D100 SLR ISO 500. October 08 at 20h 24m UT. 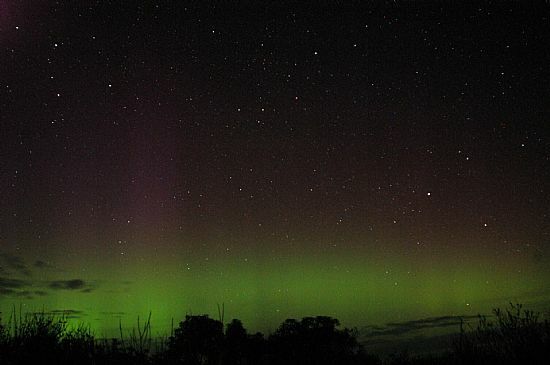 An intense auroral glow was visible in twilight on the evening of 19th September. 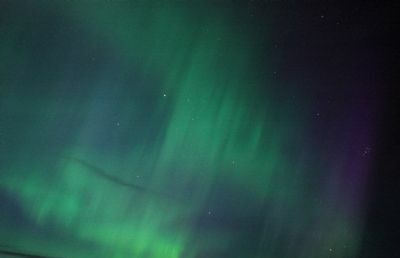 The glow separated into two arcs, one of which rose to an elevation above the northern horizon of over 60 arc-degrees and indicative of considerable activity within the northern auroral oval (region of constant auroral activity). 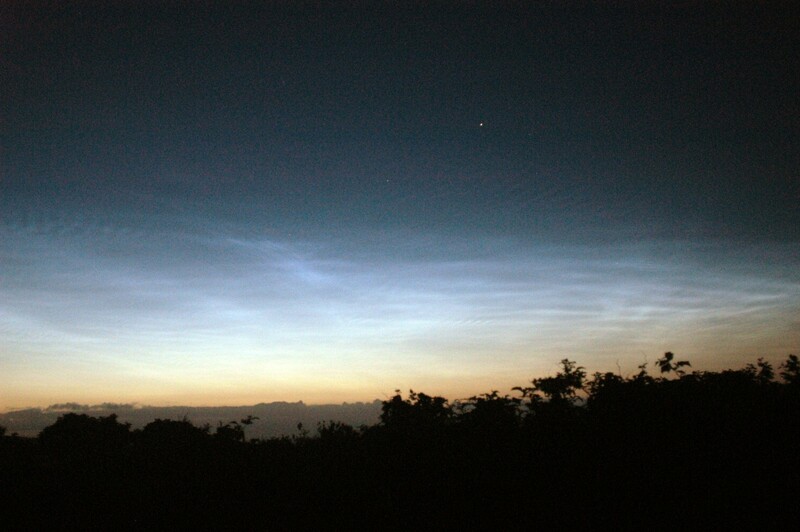 Noctilicent Clouds: 2012 August 11. 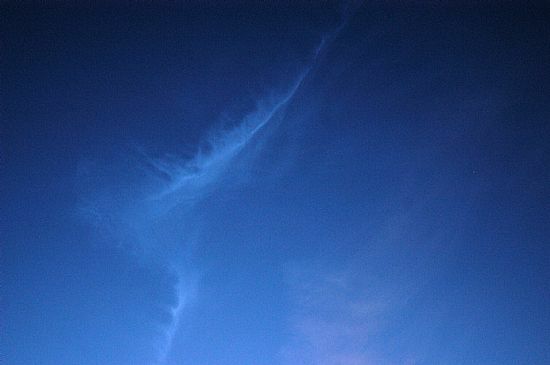 Noctilicent Clouds: 2012 July 31. 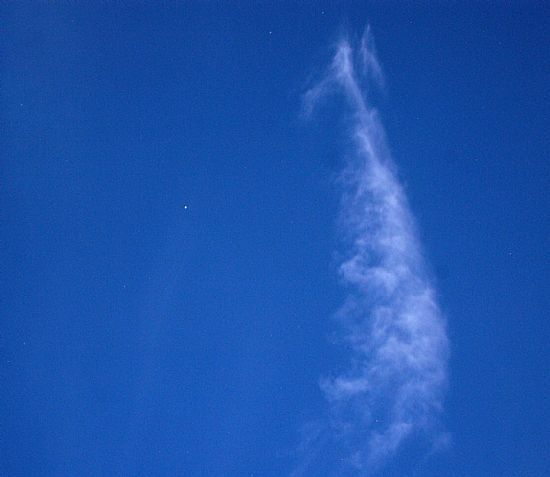 Noctilicent Clouds: 2012 July 24. 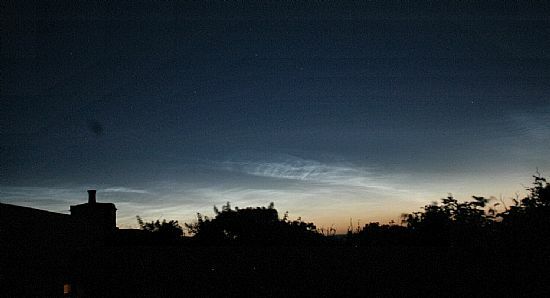 Noctilucent clouds looking NNW from Springfield, 2012 July 24 at 00h 16m UT. Nikkor 24mm f/2.8. A 1 sec. exposre: D100 SLR ISO 500. (Left click to enlarge.) Nb. Blurred foreground foliage due to wind. 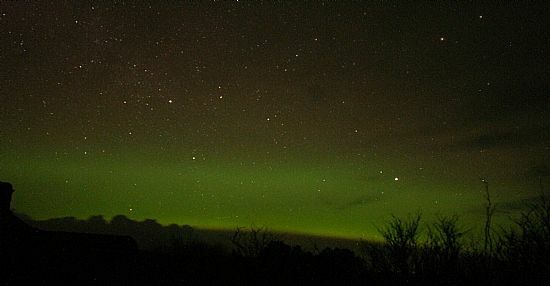 Looking north from Springfield, Rousay, March 22 at 21h 13m UT. The bright star low down to the right is Vega, second brightest star in the northern hemisphere. 2012 March 17. General, low levle background actvity throughout dark hours morning and night. 2012 March 17 04h 27m UT. Looking North from Springfield, Rousay. The bright star to the left is Capella, third brightest star in the northern hemisphere. Constellation Perseus to the right with bright star Mirfak. Auroral Actvity observer from Orkney 2012 Mach 1/2. Looking north at 09h 40pm March 1st 2012. The bright star low down is Vega (second brightest star in the Northern Hemisphere) with Eltanin (gamma Draconis) above, the star used by the Astronomer Royal James Bradley to verify the phenomenon of the aberration of light (1725–1728). 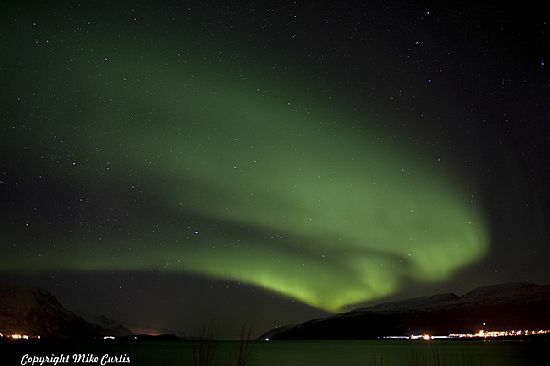 Mike Curtis, currently working in Norway, has kindly sent a selection of his images of the aurora taken 21012 January 25. All mages are the strict copyright Mike Curtis, 2012, and are provided for website use only; they may not be copied to be sold on in any form. ISO 800, 19mm, 36secs esposure. The bright star low down just above the hill is Arcturus, the brightest star in the northern hemisphere. ISO 800, 19mm, 30secs exposure. 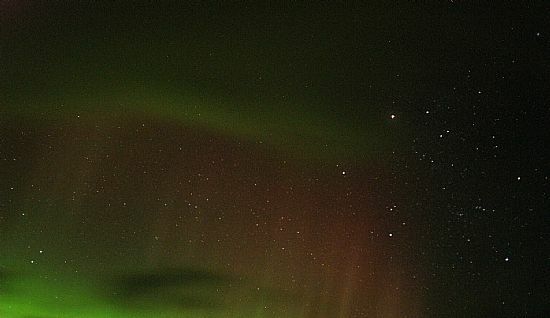 The constellations of CVygnus and Lyra are to be seen to the left with thier brightest stars Deneb and Vega (the second brightest star in the northern hemiphere), respectively. ISO 800, 19mm, 30secs exposure. Comment as for caption above. ISO 800, 20mm, 10secs exposure. Arcturus right, low down, with the tail of "The Plough" in vertical posture above. 2012 January 22, 19h 46m UT. Looking NNE from Springfield, Rousay. Nikkor 24mm f/2.8 8 sec. 100D SLR ISO 500. A poor night for observing with frequent, blustery showers and dense cloud. 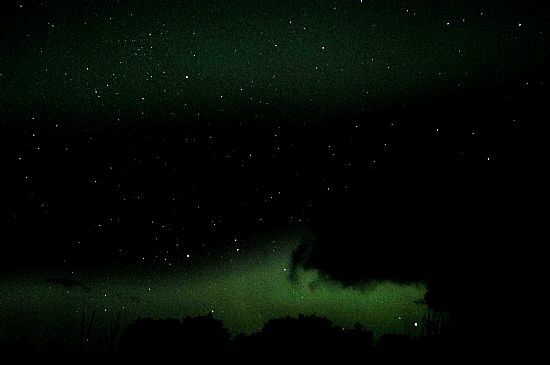 Between the cloud one could see a double auroral banding but no indication of moving elements. The activity lasted at least five hours with some indication as early (or late, according to your perspective!) as 05h the following morning, January 23. Earlier, Comet Garradd had been imaged but against residual twilight and the auroral glow—far from ideal for imaging a relatively faint comet! 2011 Septemebr 26, 21h 20m UT. Bright star Capella, lower centre, with Perseus above and to the right. Exposure range 2 sec. to 4.0 sec.